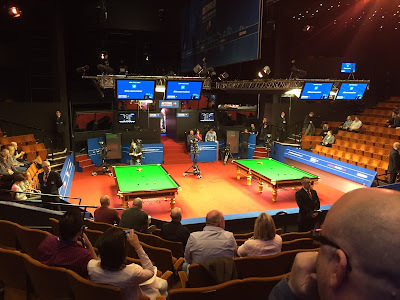 After thirty five plus years of watching on the TV, and over three years living in this great city, on Monday before last I finally went and watched a snooker match at the Crucible. If I could have told my teenage self this, she would have been so excited. 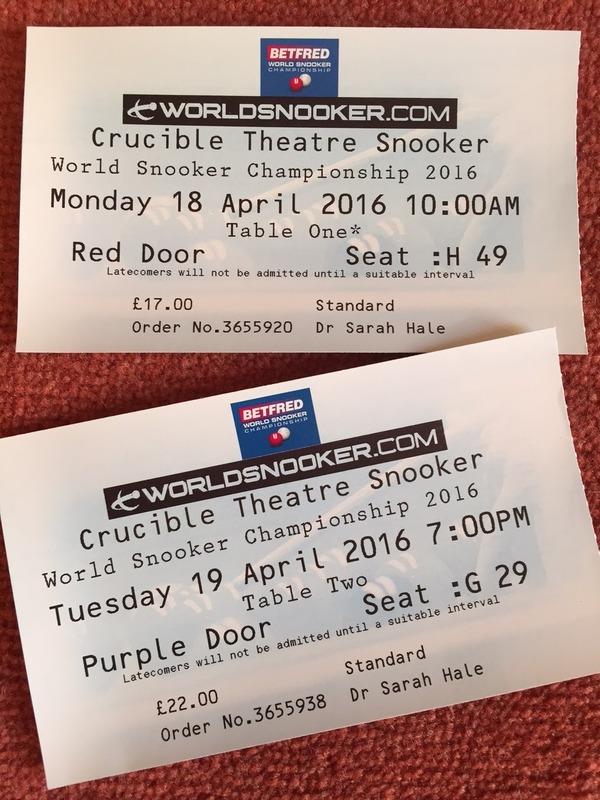 As it was, I was more curious; interested to witness the Crucible atmosphere that the commentators rave about. (I've noticed a marked increase in both commentators' comments and TV features on players singing the praises of the venue as its contract to host the tournament nears renewal with a real possibility of its being relocated to China). I've been to the Crucible before, so I knew how small it was, and did wonder how they fitted two snooker tables in. I was still surprised though to see just how little room for manoeuvre the players have, with possibly no more than three feet between the table and the dividing screen. Add two pairs of TV cameras and a referee, and it really is a very intimate setting. The audience were very much as you might expect, closely resembling if not the players, then, in many respects, the balls. A first round session on a Monday morning might not be the time to experience the most electric atmosphere but it was still great to be there. And I found when I got to my seat that I had an added bonus. My ticket was for Table 1 - John Higgins v. Ryan Day (I booked a year ago, taking complete pot luck as to who would be playing). On Table 2, Ronnie O'Sullivan was playing Dave Gilbert. How frustrating, I thought, so near and yet so far. But as I took my seat I realized that not only was I looking straight down at Table 1, but that I could see all but the top left hand corner of Table 2! And here is a photo of Ronnie to prove it. He won that match, but not the next. Had he decided to retire at that point, I could have claimed to see him win his last ever match. But hopefully he will be back. As I write four players are left in the tournament and the semi-finals are about to begin. As the second round began, I organised a sweepstake at work for the final sixteen - and I am delighted to report that the player I drew is one of the 25% to have made it to this stage. So go, Alan 'Angles' McManus, surprise success of the tournament! We got our first colour TV in 1973, for the Royal Wedding. In 1975 I watched my first FA Cup final, and became a West Ham fan, following in the tradition of my mother and my grandparents, who lived just up the road from the Boleyn Ground (people have now suddenly started to call it by its official name for the first time I can remember) at Upton Park. And the era of Upton Park is of course coming to an end, as West Ham move to the Olympic Stadium. But that's not the era I was thinking of when I started to write this. It was a few years later - I would have been in my early teens - when the Black and White Rag heralded a half hour which would have my father glued to the screen, and I quickly joined him in becoming an addict of Pot Black, as he explained the rules of snooker and I immediately realised that at last I had found a sport that could really interest me. It must have been on Pot Black that I was first introduced to Steve Davis, who joined the ranks of professional players in 1978, the year he turned 21. Nowadays, when any player over 40 is considered to be a walking miracle, it's hard to recall what a breath of fresh air it was to see a player who was not only young, but fresh, and personable. I became a fan straight away, and as with West Ham, have remained loyal, with varying degrees of passion, ever since. 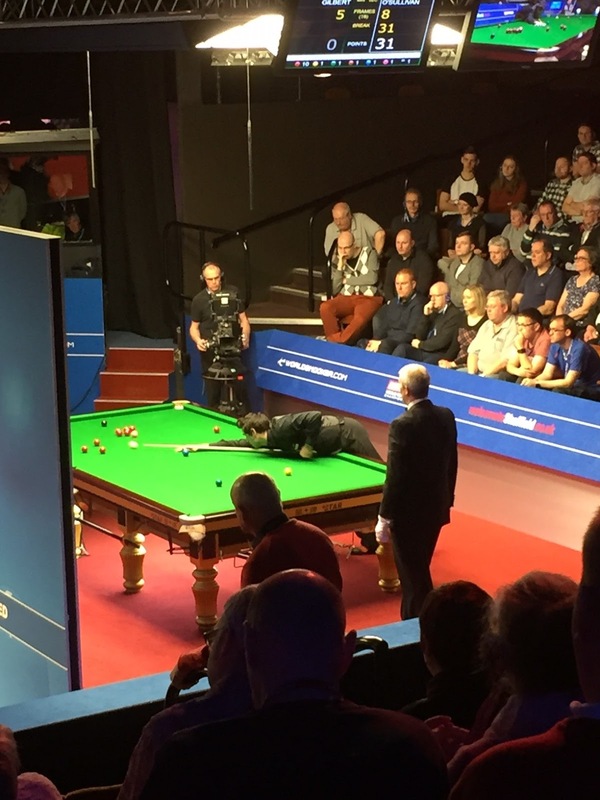 This afternoon, as I sat on my new sofa watching the World Championship, Steve Davis announced his retirement after thirty eight years as a professional snooker player. So now - other than on the television - I shall never see him play competitive snooker. But better late than never... Next year could be the tournament's last in Sheffield. No, it won't. I get the message 'some problems when uploading photos, please check your connection'. Well I have checked my connection and it's just fine thank you very much. Bigger and more photos than this upload and download without a murmur in every other app. Now I remember this is why I stopped using Blogpress before. It's clearly a very longstanding problem. Anyone got any ideas how to solve this, or a recommendation for a better app for posting to Blogger from an iPhone. With pictures. I've got a new iPad (well, new to me) and I'm just testing out Blogpress again. And that's if you don't include Britain's first mosque, which I did already know about. Not only is it the destination for the Historic Narrow Boat Club's 50th Anniversary Rally in August (of which more, much more, anon), but thanks again to Diamond Geezer I now know that it is both the setting for H G Wells's* The War of the Worlds and where it was written. Makes me want to visit for more than a day! *Had you ever wondered how to form possessives for people whose name ends in 's', I offer you what I am reliably informed is the guidance of the Oxford University Press, which I like. If the name has one syllable, add an apostrophe and an 's' (Wells's, Jones's) but if the name has two or more syllables, just add the apostrophe, as you would for a plural (Roberts', Humphrys', Papadopolous'). If you think of saying it out loud, it works. 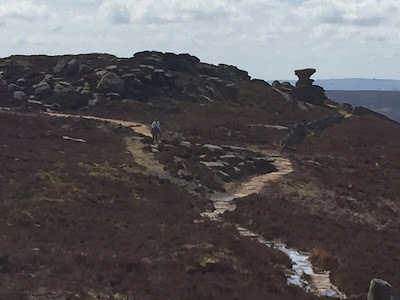 I haven't been out for a walk with my local Ramblers group for ages, but yesterday I did manage to get out with a work friend for a lovely walk along Derwent Edge - somewhere I'd not actually been before. The weather was perfect - dry and bright and a bit cold - and the views were fantastic. 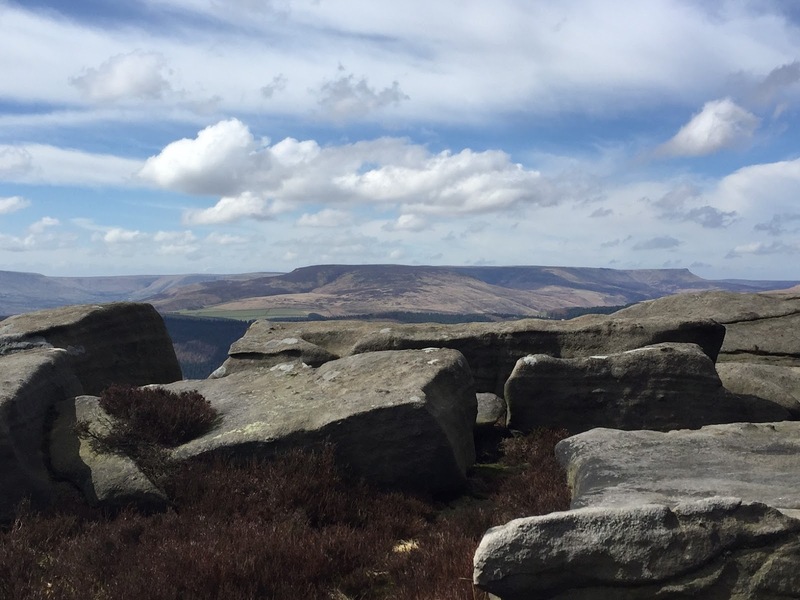 It's hard to believe that just over two years ago, I'd never been out into the Peak. We walked four miles then retraced our steps, making eight miles in all. I didn't stop for many photos so these are just a little taste. And this one, where my phone clearly decided to do something odd without asking me - although I rather like the effect. Inasmuch as I don't know where this one was taken, when, why, or by whom. I found it randomly among some books at my mother's house - it's quite conceivable I took it myself. I'm thinking possibly Northampton Arm, but can anyone identify any distinguishing features at all? 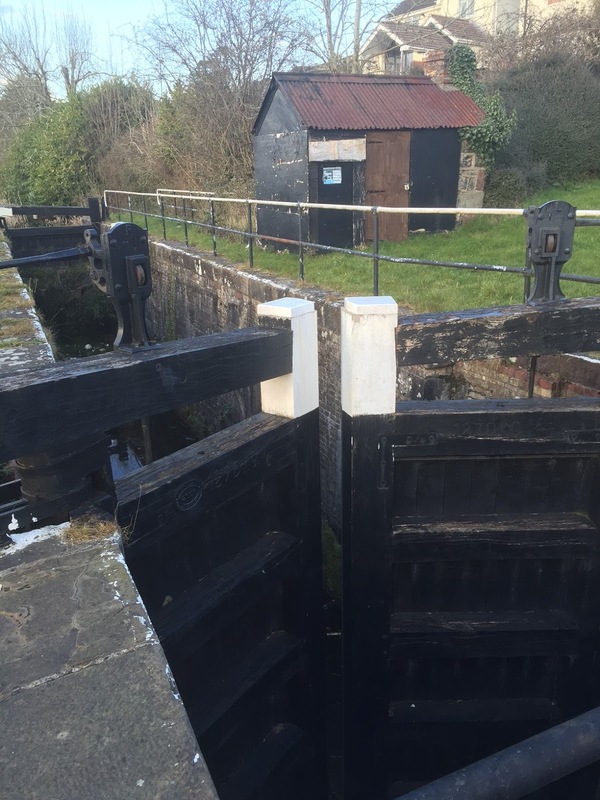 I've been slightly off the beaten track these last couple of weeks and managed to find half an hour for a quick walk, so here is a small mystery for you - where and on what waterway is this lock? 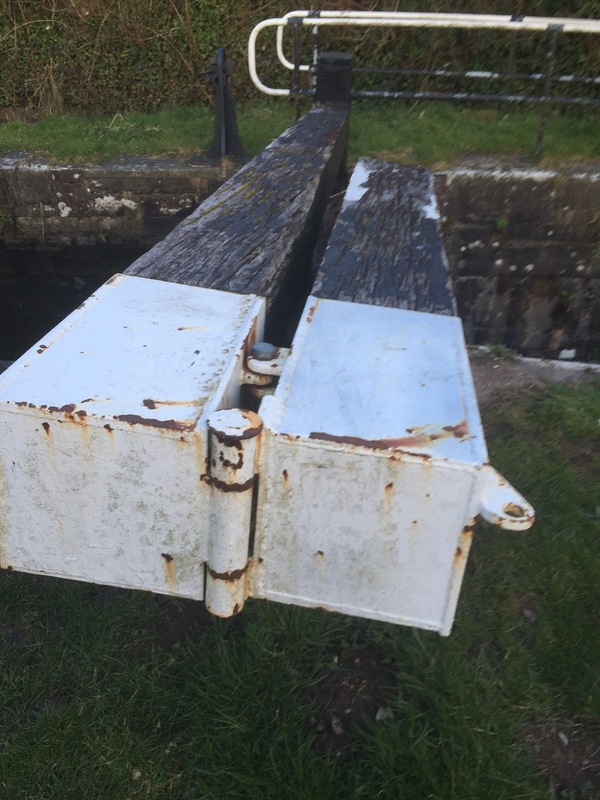 And it has this very nifty hinged balance beam, which I haven't seen anywhere else. 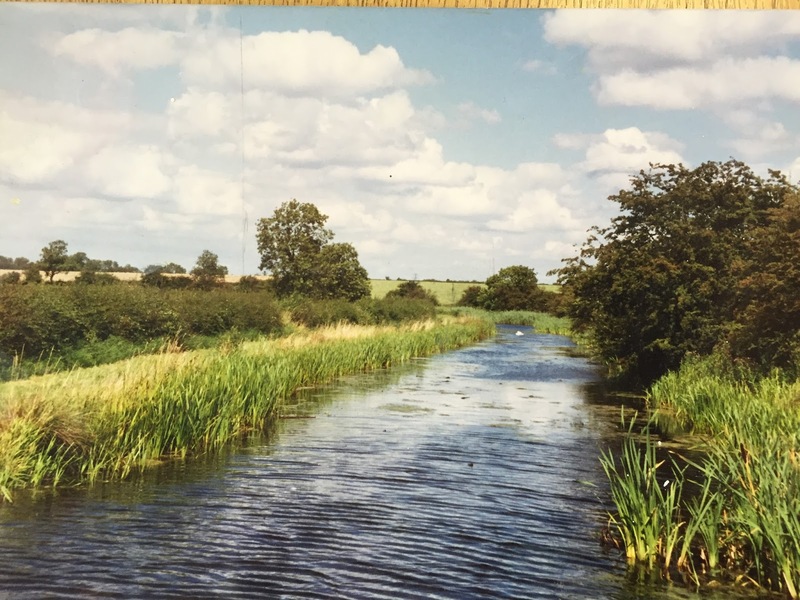 I don't actually know as much as I feel I should about this waterway, so any information about its ongoing/aborted restoration would be very welcome. Exactly ten years ago, I became a blogger, with this, in itself rather unremarkable, but undoubtedly historically significant, post. Since then, another 1,758 posts have followed. Peak posting was in 2010 - the first full year of having Chertsey - with 298 posts in total. My posting rate has dropped steadily since then despite many resolutions to do better, falling to a pathetic all time low of 44 in 2015. 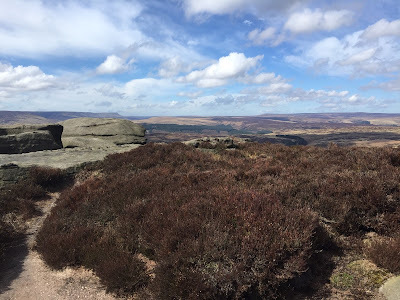 I said last year that I would wind the blog up after ten years... I don't want to do that though - but neither do I want it to drag on in its recent moribund state. 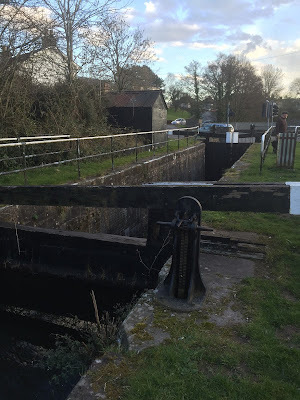 I have an idea for a new blog, covering my boating experiences, but with a broader remit than boating alone. My blogging hero of course is Diamond Geezer, with his daily posts on an idiosyncratic but always interesting mix of London life and everyday life itself (with a current focus on Bow Road's Bus Stop M). There is no reason, I tell myself, why I couldn't do this. DG and I are the same age, both work full time and live alone in a city... and I could certainly do with getting out more. I am rather busy and away from my computer for the next week or so, but I've decided that I'm not going away, so watch this space for further developments.